Happy, sad and Love & Monsters (2006) | Randomwhoness: a Doctor Who blog by Johnny Spandrell. Sampling stories in random order. So, Love & Monsters. I’m very tempted to write about representations of fandom in Doctor Who. But I think there’ll be other opportunities to do that. And I’m very tempted to talk about its structure, which is a thing of beauty; unique in its narrative approach, metatextual and rhythmic in its plotting. But instead, I’m going to talk about tone and, believe it or not, a bit more about Mindwarp. My last post was all about structure and how Mindwarp’s was pretty clever (or at least cleverer that it’s usually given credit for). But I refrained from talking about tone, because, well… I’m trying not to include every single idea I have about a story in one blog. But watching Love & Monsters straight after Mindwarp reminded me that tone goes a long way in helping or hindering a story. Mindwarp’s tone is all over the place. It’s an uneasy mix of violence and comedy. Time and again it shows an unpleasant event followed by a joke, usually delivered by Sil. It says something that on Varos Sil was a real figure of threat; Thoros Beta is so grotesque that his threat becomes impotent and he switches to being a punchline machine. It culminates in Peri’s death, a truly chilling moment, which is then punctuated by Sil grumbling about her supposed ugliness. Add to this the eye-watering colour palette, and the bombastic incidental music, and you’ve got a real assault on the senses. It jars. But Love & Monsters’ tone is spot on; just as dichotomous as Mindwarp’s, but more balanced and consistent. We know from then showrunner Russell T Davies that part of New Who‘s pre-production process is a tone meeting, where he would equip the key production staff with a word or phrase to sum up the feel of an episode. I wonder what Love & Monsters‘ was? My guess is that it was two words. The clue is in the title: Love & Monsters. Salvation & Damnation. Happy & Sad. Comedy & tragedy. Side by side. Let’s start with comedy. Or if it’s not quite a comedy, it’s still pretty comic (or comedic, I suppose. What’s the difference?). Which comes as a relief on its original broadcast, as the preceding story The Impossible Planet/The Satan Pit was very dark indeed. New Who, like Old Who, is full of humour, but this was the first time it became the focus of an entire episode. The humour is delivered not by the plot (a group of friends is infiltrated by an alien seeking to use them to track down and kill the Doctor) which is as serious as any other Who story. It comes instead from the characters themselves. The friends themselves are a ragtag group of oddballs brought together by their awareness of the Doctor. They come from different walks of life and all have different stories. But their common factor, and the reason they’re funny, is that they’re all dags. For those unfamiliar with the term “dag”, it’s a brilliant Australian slang word. It originally meant, ignominiously, a bit of dried poo hanging off a sheep’s bum. But its usage these days is, as wikipedia puts it: “as an affectionate insult for someone who is, or is perceived to be, unfashionable, lacking self-consciousness about their appearance and/or with poor social skills yet affable and amusing.” I can think no better word to describe the members of LINDA; they’re not social misfits, they’re not outcasts, they’re dags. 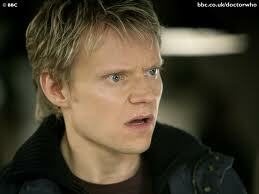 Take Elton (Marc Warren, being endearingly goofy), our chief dag. He’s speaks just a little too earnestly. He tucks his shirt into neatly pressed jeans. He dances like a white man. To ELO, of all things. He’s still a nice guy, but he says funny things without realising it. Like when he says: “I had to invent this rudimentary pulley system, just to reach my boots.” What a dag. Then there’s Victor Kennedy, funnier than all of LINDA put together (and as he’s played by comedian Peter Kay, you’d expect him to be). He’s a fan turned bad. His obsession and self-importance have turned him into parody. He dresses like an impresario. He’s inherently theatrical; his first line is “Lights!”. He can’t be touched because of his ’exzeema’. “I don’t like to be touched,” he pronounces. “Literally, or metaphorically, thank you very much.” Even when he transforms into the corpulent Abzorbaloff, he’s still cracking funnies (although now in a working class accent). “Tastes like chicken”, he quips after devouring Ursula. DOCTOR: Not from Raxacoricofallapatorius, are you? VICTOR: No, I’m not. They’re swine. I spit on them. I was born on their twin planet. DOCTOR: Really? What’s the twin planet of Raxacoricofallapatorius? This comic tone allows the story to get away with what might otherwise be seen as some plotting misteps. The story requires a massive coincidence – that Elton finds Jackie almost immediately the vastness of London – but that moment is played for laughs (Elton talking about how massive the task is, then a jump cut to him meeting Mrs Croot who identifies Rose from a photo), so we forgive this huge plot contrivance. It’s a joke; we get it and we move on. The tone helps paper over a few other bits and pieces. Who is the Abzorbaloff? How did he get to Earth? What’s he doing here in the first place? And Elton’s encounter with the Doctor and the Hoix might make for “a brilliant opening” but shh, say it quietly, it’s unnecessary to the plot. Using a story’s tone to disguise its narrative gaffes is a neat trick. But Love & Monsters’ real success is that among the laughs, it tells a couple of very sad stories too. One is about Elton’s Mum. Being reunited with the Doctor at the story’s climax allows Elton to find out what happened on the night she died. Director Dan Zeff shows a haunting deftness when Elton’s Mum disappears and the picture flares white to the closing chords of Mr Blue Sky. It works because we’ve grown to love Elton through the story’s comedy. And it works with Jackie as well, a character often used as comic relief in New Who’s first two years. And she’s funny here too, but she gets a cracking scene where she confronts Elton after she discovers Rose’s photo in his jacket. Camille Coduri, always brilliant, is especially so in this scene. “Let me tell you something about those who get left behind”, she bawls at him. “Because it’s hard. And that’s what you become, hard.” Just as with Elton, she’s gone from a figure of fun to someone we genuinely feel for. Appropriately, the story ends in both victory and triumph. The Absorbaloff absorbed by the earth, but Bliss, Bridget and Mr Skinner, lovely dags the lot of them, all killed. Ursula lives, albeit trapped within, of all things, a paving stone. And as Elton worries about Jackie and Rose’s safety as long as the Doctor’s around (salvation and damnation are the same thing), he’s told not to be so morbid; there’s still time for his final video diary entry to raise a smile with some surprisingly filthy innuendo. That’s Love & Monsters for you. Sticking to that happy/sad tone right to the end. And appropriately enough, it’s a story which fans love or hate. Well, chalk me up as one of the lovers, because it shows how to use a story’s light hearted highs, to make us we feel its lows all the more poignantly. LINK to Mindwarp and Turn Left, as it happens. All three feature popular contemporary TV comedians in lead roles. NEXT TIME: So close you can feel the heat! We’re off to the cinema for Dr. Who and the Daleks. I have a theory that Ursula does not actually survive. This is an “unreliable narrator” story and we never see her from the (nominally objective) POV of the video camera, and only from Elton’s subjective POV. Personally I think Elton’s gone a bit round the bend and is just telling himself another comforting story to cope with his loss.